My second haul in one week, it appears that having a drained bank account at the end of January is having quite unusual effects on my spending willpower! OK so my Sephora Haul was a bit of a celebration so felt mostly justified, but this? I just thought they were pretty. Topshop jewellery for me is always a little hit or miss. Sometimes I look around the huge jewellery section in the Oxford Street flagship but fail to find anything wearable, but other times, I’ll want it all. 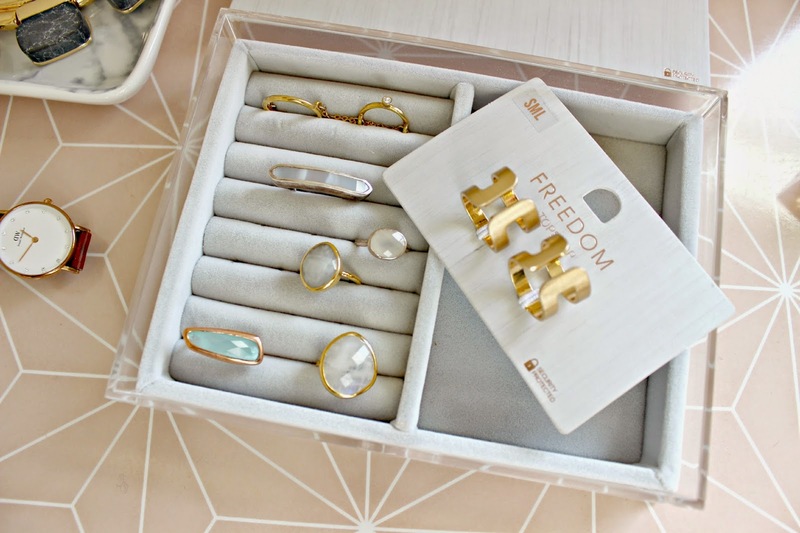 This particular occasion was definitely the latter, and it was love at first site when I spotted their new FREEDOM range featuring semi precious stones. The necklace on the card at the top is a dainty triple row gold chain, with a gem on the top tier, a kind of gold twig-like charm on the middle row, and then delicate gold rings looped through the bottom tier. I’ve recently been wearing this to add a bit more elegance to my roll necks. Annoyingly I can’t find the exact one online, but a similar one is £10, here. I purchased two other necklaces, firstly a choker-like gold and marble effect necklace with three semi precious stones. Again this one looks great with roll necks but the stiff metal sometimes makes it hang a bit strangely. I’m still getting used to it. I also picked up a few rings, in the top picture you can see the solid copper ring which I’ve been wearing quite frequently, and also the two open rings in the image above. They are pretty edge for me (so… not very edgy then!) and I’ve been testing them out with various combinations of dainty rings and bracelets recently to see how I can get them to work bet for me. As for storage, I’ve been keeping my new pieces along with the rest of my jewellery in this Muji drawer stack, I love that it’s clear and you can see your jewellery inside! 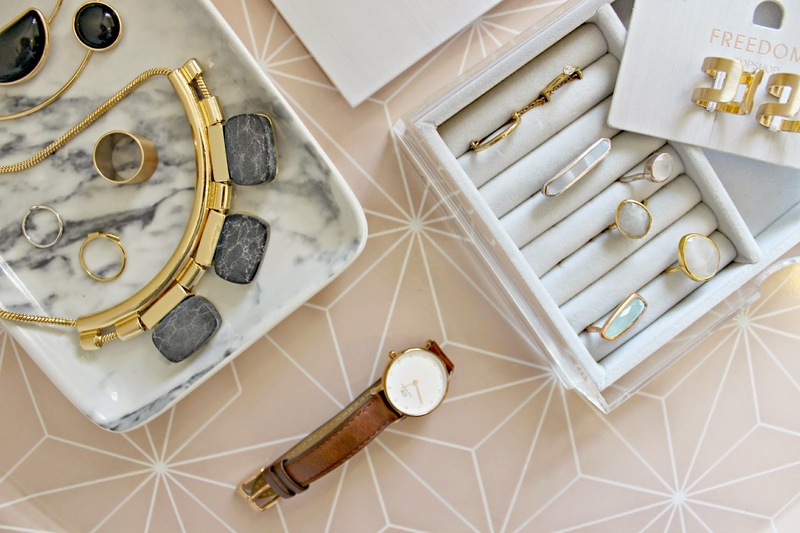 The marble tray is from H&M Home and I keep my day to day pieces in there on my dressing table. 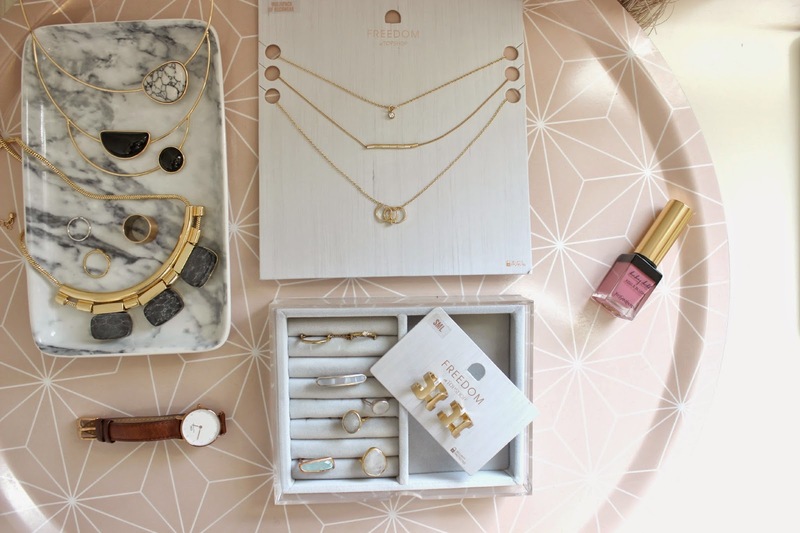 Have you had a jewellery haul recently? Next Post This Week I’ve Been….